The functional brain imaging facilities of the Center of Mind/Brain Sciences (CIMeC) are extended and complemented by a new magnetoencephalograph. Magnetoencephalography (MEG) is an imaging technique that allows the study of the temporal dynamics of cognitive brain processes and its localization by recording the magnetic activity of the brain. On the occasion of the opening of the laboratory a symposium will be held. The symposium will offer an opportunity to be informed about the abilities of MEG and to discuss research ideas. To this aim invited speakers will present an overview of MEG applications in neuroscience. A poster session will allow be held to discuss own work and future MEG projects. 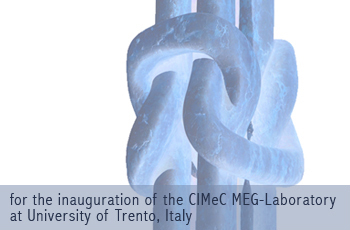 The symposium is organized by CIMeC and will take place in Mattarello, Via delle Regole 101. We cordially invite you to the event and look forward to your registration. For participation, registration via email is mandatory before April 30th 2009.